I am better understanding your constant tweaking and building as I am doing something similar with drums, having been playing drums in a band for the last 5 years I am experimenting with getting them to sound and work how I want, now that I know what I want from them. All the best for a great time with this build, Megi. I admire your ability to dive in. I've got so many projects in the "planning stage" that the idea of building a guitar I don't need just can't exist. I need gutters on the big shed and it needs an additional layer of felt. I'm building another stairgate for the grandson at their cottage (that will be 5 with the two at my house). I'm still organising my garage workshop and need to make cabinets and shelves to get the stuff out of boxes and off the floor. Its growing season so the allotment, gardens, greenhouse and hanging baskets reguire attention. I've got to replace 3 radiators and arrange fitting of two replacement windows. Some of the woodwork needs painting too. I've just had a weeks holiday at home last week and these are some of the jobs still to do! So Graham you should go for it and go big. Just this morning found a very nice looking Allparts neck for sale (on "the other" forum) with some attractive grained dark rosewood, 12 inch radius, jumbo frets - which are the specs I'd ideally have chosen, so I have secured that one. My experience is it's not a good idea to scrimp on the neck - you get what you pay for. And I've just ordered an ivory pearl scratchplate and backplate from ebay. Thinking about the other bits I need - machine heads - I will probably go for the modern sealed type, rather than the vintage Kluson style, in which case I'll need to widen the holes on the headstock to 10mm (Allparts necks are drilled to the vintage 8 point something mil spec). Also I believe this neck is unfinished, so I'll go for something to give a thin, natural-feeling, satin kind of thing - maybe Tru Oil, or Danish Oil. May just give it the sublest of stains to warm the look up slightly, but not sure yet. The trem bridge, almost certainly will be a Wilkinson modern type - I have them on my previous strat builds, and they're great, for a friendly price. Pickups - hmm, not sure, but there's a Croatian seller on ebay that looks to do some very nice stuff at fair prices. Or I could talk to Ben Fletcher of course. And there's various other bits needed of course, quite a few of which I will already have in the spares box, having done all the mods and builds in the past. I didn't need another strat, but I still hope to make something very nice, and with it's own distinct personality. The body has arrived - it is very glossy, and very gold More of a yellowish gold than a coppery gold if that makes sense. Perhaps I was expected something a little subtler in looks I suppose, although I really don't mind - it's pretty much what I ordered I guess! There are a few flaws in gold layer of the finish, which are noticeable if you hold the body at a certain angles to the light - it's almost like the kind of unevenness you would see looking at a large area of gold leaf, or on an ageing mirror. I've decided I'm OK with this anyhow - it's only visible under close scrutiny - the sort of thing you forget about unless you go looking for it. Also, it does look like the gold spray layers have been done deliberately thin, rather than building up a thick coating, which I'd say is a good thing. The gloss finish over the top is immaculate and mirror-smooth. The body feels reasonably light weight, and has a nice hollow ring when I tap the wood with my knuckles, which is something I look for. 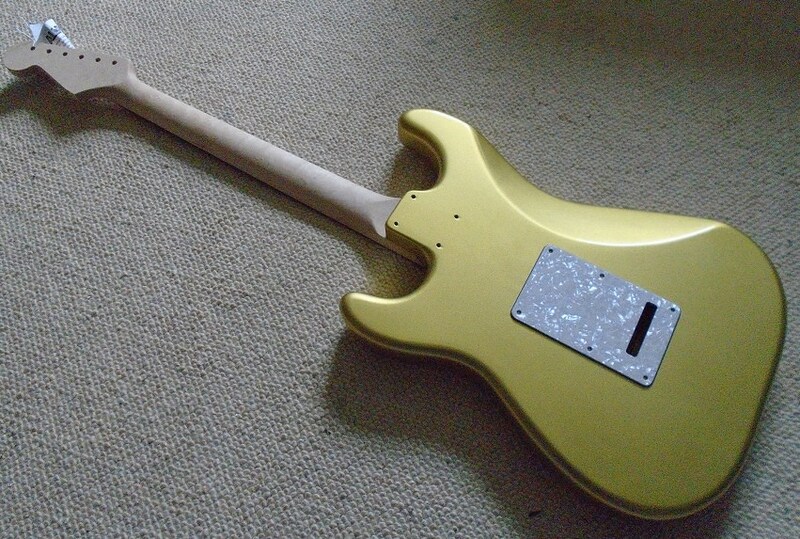 So - it does seem a bit "bling" of me at the moment, but I hope and suspect it will be a bit of a wow when I have the guitar assembled, and adding the neck and pickguard will refine the look - hoping for the sort of thing that would make you look twice if you passed it in a guitar shop, for the right reasons. Just some pictures of the limited progress so far - I had to sand the sides of the neck pocket to allow the neck to fit - it's now a snug but not too tight fit, which is about where things should be. There's a bit of nice birdseye figuring on the neck - I'm going to finish it with either Tru Oil or Danish Oil, and just go for a thin, natural wood kind of feel. I've got all the other bits I need ordered now, and already had one or two parts in my spares box. For the pickups, I decided to go economy this time - it's a set of Vanson Guitars Classic Pro strat pickups, just £38 for all three, but should be interesting to see what these are like. Ooo very nice! This is going to be great. Having another tool in your kit would no doubt be handy, and you’ll learn more stuff along the way. I find different wirings inspiring so maybe you could try something other than the normal five way thing. I recently got a stacked Irongear single coil for the neck position of a strat type guitar. Love it! Normally it’s vintage spec, but with a push/pull (other switches are available) it goes into overwound mode, about 11k. It’s like a passive boost, making it more like a p90. I’m sure other people make things like it, including mr Fletcher. It’s such a great feature! The guitar also has a switch to out the bridge P90 straight to the output, bypassing all controls. That too is like a boost. The stacked Irongear pickup sounds to be excellent Nick - I think I'd probably like that a lot myself, since P90-ish sounds can be good for jazz playing. And I was just watching an Andertons video demoing the new American Elite range, and they have exactly the same thing on a strat with a bridge humbucker i.e. a switch that just bypasses any circuitry and sends the full output of the bridge pickup to the jack. What I like is that a) it's simple, and b) it gives you the n+m/m+b series combinations, which are more humbucker-ish in tone, and the ability to blend to these from single coil tones. I don't expect it will be just like switching to a good 2 humbucker guitar, but it could be handy (the new Fender American Elite strats have a switch that does the same thing, so they obviously think it's worthwhile). Waiting for parts to arrive at the moment! Ivory pearl pickguard and backplate arrived - is it too much? I'm asking myself, but I hope the addition of clean chrome hardware and black pickups/knobs will cool it down, and give me something like the Suhr I took inspiration from. I continue to be really impressed with the quality of your work and that of the suppliers you choose, Megi. Thank you Lester! All I've done so far is a bit of sanding in the neck pocket, and laying the parts together and taking photos - so little chance to exhibit quality work from me as of yet. As to the suppliers - yes indeed - I find it is important to get parts that are well made and in clean/new condition, and I choose carefully. 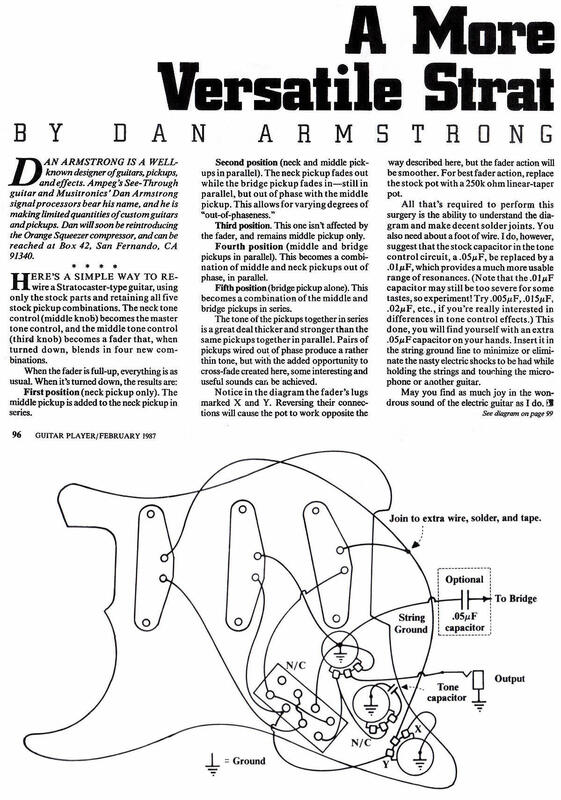 That said, I've seen other people do very nice things starting with somewhat "grotty" second-hand, or cheaper, parts that are needing a bit of know-how and work, but in my case I need to be able to visualize a simple route through to the finished guitar, with steps that I know I can handle. That probably means I tend to spend a bit more on the bits for my builds, but it's still good value for me, as long as I produce a great guitar at the end. 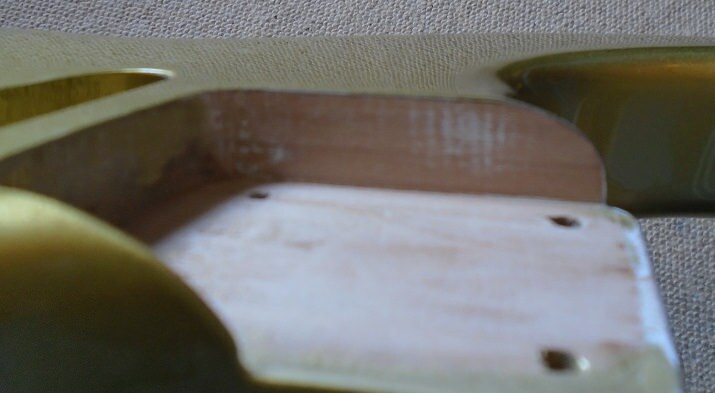 The pickups seem not too bad - they were a bit of a tight fit under the covers, so I very cautiously and carefully removed the cloth tape wrapped around the coils, allowing a better fit. Not sure I'd recommend that, but I seem to have got away with it. Also testing shows them to be a bit hotter wound than advertised - something like 6.5K neck, 6.7K middle and 7.3K bridge (advertised as 6.3K neck and middle, 6.8K bridge). I guess I don't mind this - the extra winds on the bridge will certainly help, from experience - just talking about my own taste with strat pickups here, which is that a very low wind vintage style wind on the bridge pickup can be just too thin and sharp sounding. Probably the most stunning Strat that I've ever seen. What vision. I've never seen one that colour or lustre before. Thank you! for a 64 year old guitar design, that is quite something. I've said it before, but I do think the stratocaster is an extraordinary design - just a beautiful thing, and hasn't dated at all. I find it fascinating really, which is perhaps why I'm building another. One day I'll have to buy a "proper" one! Personally, the gold on Megi's doesn't do anything for me (that's my problem, not Megi's) but the rest looks brilliant. 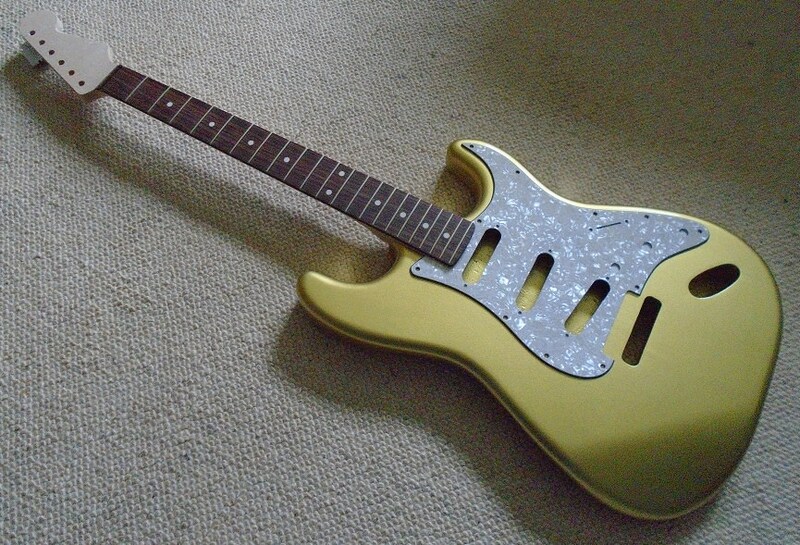 You can see why when compoared to my 1986 Japanese HSS Strat. 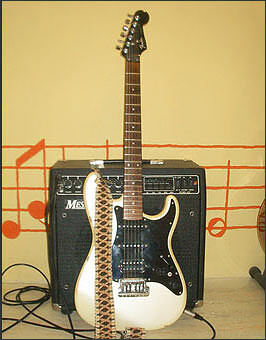 I got my Strat when it was 2 years old; wow, we have been together now for 30 years and it is still my favourite guitar. I think that's a wonderful thing Lester, a lovely guitar, and I can see it is well looked after and appreciated - now I think about it, I can dimly recall admiring stratocaster models like yours in adverts in Guitar Player magazine back in the 1980s. And tastes will always vary, quite legitimately, so there is no problem there, for either of us. Everyone needs a gold guitar in their stable. I need to fix that....! The schematic you have looks really interesting. I’ve never seen one like that, so to have something a bit different would be inspiring I’m sure. Lots of funky tones! I can’t get my head around what positions 2 and 4 are doing, but out of phase can be a great sound. I love having two singles in series, especially on bridge and middle pickups. That’s the setting Brian May uses 90% of the time (he says). As I’m sure you realise, the difference in impedance can be due to humidity and temperature, so meter readings will rarely match manufacturers claims. Some people quote impedance two two decimal places, which I’ve heard is just nonsense. One is plenty, if not a tad misleading. Looking forward to hearing this one, Megi! 30 years, eh? Are there some memorable dings and scratches that make it yours? It has a few dings and scratches but none of them are memorable, by which I mean I cannot remember how any of them were done. By and large, it is in reasonable to good condition. I always reckon I could improve the sound with better pickups - and Megi is sure the wonder kid in this department - but I am not unhappy with the original pickups so I have yet to experiment. Hi Nick - re the wiring scheme, what really appeals to me is that it gives an option to have a couple of fuller-sounding hum-cancelling tones. I doubt these will be as nice to my ears as proper humbuckers, but they could be useful. 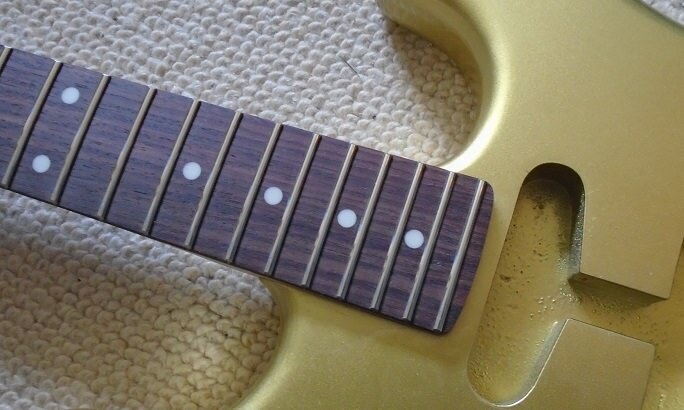 As to the out of phase tones - normally I'd think that adjacent strat pickups out of phase would be too thin and trebly to be useful, but with the ability to blend in just a bit of "out of phaseness" it could have some value - bit of an experiment on that one. The whole thing's an experiment really - from having used my other strats, I have to admit that the tones that I find myself using in gigs are just the standard ones - those 5 are more than enough really, and probably the best-sounding (again to my ears) in normal circumstances. It was DC resistance I was quoting (not impedance) but yes of course you're right, it does vary with temperature. But even allowing a reasonable amount for this, it seems to me my pickups are a bit hotter wound than the stated figures. On the other hand, they probably say + or - 10% in the ad, so they'd be within range in that case (10% is a lot though!). I'm no expert or wonder kid Lester, really - just someone who's dabbled a bit trying various things, and certainly not enough to have any kind of comprehensive knowledge. Nick has actually made his own pickups for some of his guitars - that makes him more of an expert than me. Also, given you've had your strat for as long as you have, and it's still your favourite guitar, and you're not unhappy with the pickups - this makes me think you should at least be a bit cautious about replacing them. You might find there is something about the sound of the originals that you'd lose, and miss - "better" is a subjective thing. Megi, picking up on your comment about thinness, the Out of Phase sound on my strat is too scratchy in the mid/bridge position without the tone knob (which is normally for the mid PU only but works for the combination) set quite low, typically around 3 on my regular strat. I do use quite a bright amp setting so that it can get a little hairy in tone without deing very noticable. For the neck/middle selection it's still wide open but I tend not to use that so much. Not that I'm telling you how to go about it, just what I've found that suits me. If it ain't broke... to put it another way I suppose. I will admit to having changed things myself, perhaps searching for an indefinable something I'm not even sure of, and then realized I miss what I had before. 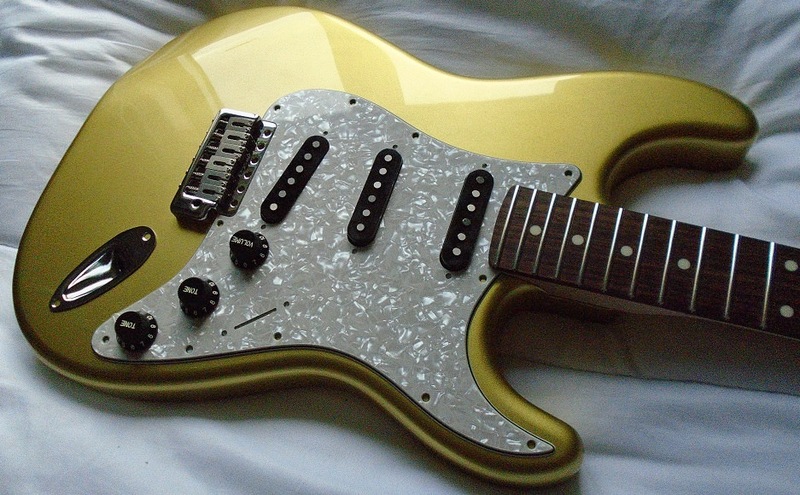 True value for money is having something great like your strat, and then getting years of enjoyment from using it. No problem, very interesting to hear about ES, thank you. For myself, I think I tend to like a bit fuller kind of a strat sound on the individual pickups, but then I have sometimes felt I actually wanted a bit more of the Knopfler-esque quack on the in-between positions. I could be very wrong, but maybe adding a tad of true out of phase with the blend control in the circuit I posted will help there. You're right of course, using the tone control can help tune things in - I do this a lot with other guitars when playing jazz and it does help to accomodate different sounds in different venues. With the covers band I've been playing in though, I really find it a bit of job doing quick changes from sound to sound - change patch on Helix, switch pickups, adjust tone - solo! - change back again and straight back into rhythm guitar. Hard to get all that seemless, but I do my best. Nick has actually made his own pickups for some of his guitars - that makes him more of an expert than me. It was late. Yea, those killer ome things is what I meant. My extremely limited knowledge of electrics type stuff is basically all to do with what you find in a typical guitar circuit, and I just think of it as a kind of racing track, where you can switch in and out certain sections where the pickups are. Or maybe go down some of those sections in the opposite direction if you want out of phase, or whatever. It seems to work somehow, but I don't really know what's going on properly. Also things like the need to have things earthed, and shielding and stuff - I figured out sort of an understanding of what needs to be done, and the easiest ways (for me) but at the same time I really don't understand what earthing actually is. Well Megi, I’m afraid that I probably know less than you! Impedance is when things are stopped with resistance, I believe. (Shrug!) My electrical knowledge is also limited to electric guitars. I can never remember how to measure the resistance on a pot and have looked it up about twelve times! As far as I know, earthing is sending signals to earth, which is where all electricity wants to go anyhow. A bit like electrical gravity. When you earth signals they skip the circuit and don’t affect sound. Wikipedia is probably your friend here! On the other hand I can probably wire most basic guitars without a diagram now. Most, not all! Actually, that diagram you have here confuses me with options 2 and 4 but I could spend some time studying I spose. All a means to an end! I guess that's it Nick - probably like you, I learnt enough to do what I wanted with guitar wiring, but no more. But interesting in it's own right, and I wouldn't mind studying electronics further. Proper work on the build finally started - first job was filling out the vintage-diameter holes on the headstock to take modern sealed tuning machines (I'm not a fan of the vintage Kluson style). Just did this with a round section file, doubtless not the proper method, and it took ages, but I've got where I wanted to be, which is what matters to me. Care and attention given to keeping the holes in line and of the right diameter - note ruled pencil lines to assist with this. A wonky line of tuning machines would not be a good look! Next up is making a nut, which will need a 12" radius curved base to fit - have found some advice on the net for doing this, and I've already got a couple of suitable bone blanks, also pictured below. Another time-consuming one I reckon, and then I've still got to file a bit of thickness from under the 22nd fret extension so it fits over the pickguard, also do a full fret level and dress, probably just round/soften the fingerboard edges, and of course apply some sort of finish (am thinking Tru Oil for the headstock face, but maybe Danish Oil for the back of the neck, to get a thin, satin, natural wood feel).